Notice: The Recreation Department is looking to see if there is any interest in starting a Women's Basketball Program. If any post high school aged residents are interested in directing and/or playing, please call the Recreation Office at 401-568-6206, x 224. Our Arts and Crafts instructor is at the beaches twice each week during summer swim lessons. There is no fee, but this program is for Glocester children only who are between the ages of three and twelve. Registration for Glocester Little League baseball and Girls Softball occurs January through March. All Glocester boys ages 5 through 16 and Glocester girls ages 5 through 16 are eligible. (Foster girls ages 7 through 16 are eligible for Glocester Girls Softball, too.) The Glocester Little League also operates a Fall League and a Challenger Division for physically and mentally handicapped children. A copy of each player's birth certificate is required, along with a specified fee. Contact Jason Whitford, the Little League President, at glocesterllpresident@gmail.com for details. Opening Day and the Annual Parade are scheduled for mid to late April. Additional information is available through the League's web site at www.glocesterll.com. Boys' Program: The Recreation Department has sponsored this activity for many years and it is still going strong. A boy who will be 7 years old by December 31st is old enough to join. All boys between this age and 14 (but not in the 9th grade) are eligible. Games are played on Saturday mornings at the Ponaganset Middle School. This program consists of up to 24 teams in 3 divisions. Also, all teams have one practice per week for one hour. Girls' Program: Girls who will be 8 years old by December 31st are old enough to join. Girls between this age and up to 10th grade are eligible to play. Games are played on Saturday mornings at Ponaganset High School. We will have about 18 teams in 3 divisions. All teams have one practice per week for one hour at a local gym. Boys' Program: Steve DiGiacomo will direct the program this year. To register either email Steve at sdigiacomo@hhs.org or register by mail using the registration form below. A $25.00 fee is required at registration ($50.00 per family). Girls' Program: Our director this year is Michael Hassell. To register either email Michael at hassell5794@verizon.net or register by mail using the registration form below. A $25.00 fee is required at registration ($50.00 per family). This is a "pick-up" league for boys entering 5th grade through 8th grade, and high schoolers. We have outdoor lights at Glocester Memorial Park, so our basketball courts will be lit nightly until 10:00pm from Memorial Day through Labor Day. Please note that some nights are reserved for league play. This popular activity is open to all our residents who are of post high school age. Whether you are a regular, a one-timer, or a veteran looking for a little more exercise – you'll be welcome. There is no fee. Mr. Carl Buckley is the longtime, veteran director. He does a great job making sure everyone gets playing time. Carl Buckley directs this "pick-up" league for post high school adults. Come when you can! We have outdoor lights at Glocester Memorial Park, so our basketball courts will be lit nightly until 10:00 pm from Memorial Day through Labor Day. Other unlit courts are available at Winsor Park and Ponaganset High School. Try to keep your game to an hour if others are waiting. Please note that some nights are reserved for league play. BEACHES: Bus Trips To Wheeler Beach (Sand Hill Cove) are no longer sponsored by the Recreation Department. Our two public swimming areas open in late June. Lifeguards are on duty at both the DiFonzo Recreation Area on Spring Grove Road and the Marion Irons Beach on Snake Hill Road. These facilities are open to all Town Residents from 9:00 am to 6:00 pm daily (weather permitting) through the latter part of August. 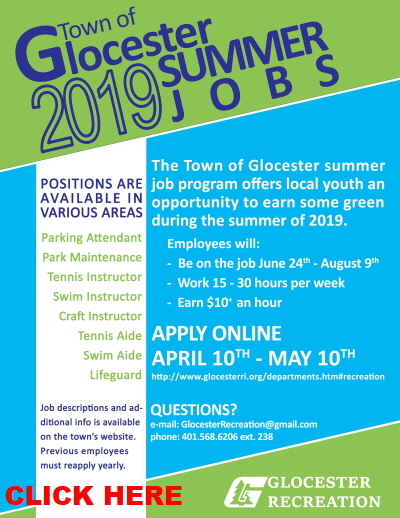 All town residents should display a Glocester sticker on their windshield for entry to beach areas. Stickers are available at the Town Transfer Station at no charge. Beaches open Saturday, June 17th and close Sunday, August 27th. Residents of Glocester, Foster and Scituate are eligible to play for the Tri-Town Titans. For more details, registration forms, and contact information, contact Nelson Pedro at 401-226-1515. The Summer Concert Series keeps getting bigger and better. The concerts start in June and continue for several weeks every Wednesday evening. All our Recreation Department concerts are held on the beautiful grounds of Chepachet Union Church across from the Glocester Town Hall. Each begins at 6:30 PM and lasts for 90 minutes. A great evening out for senior citizens and families, so bring a blanket or a lawn chair and come relax for a while! They are sponsored by the Town of Glocester Recreation Department. All our concerts are smoke-free and alcohol-free events. Glocester is dotted with ponds and lakes that are perfect for recreational skating when the weather's right. Please contact this department for info on ice safety or call the Ice Safety Hotline at 222-2632. If the weather does not cooperate for safe skating, the town will arrange for free skating for Glocester residents at the Smithfield Ice Rink. Dates and times will be posted as determined. The Smithfield Ice Rink usually guarantees at least two free skating sessions each winter for Glocester residents and their guests. We try to schedule one during the Christmas School Vacation week and one during February Vacation. Exact times and dates are announced as soon as the rink gives them to us. An in-line skating area is available at Winsor Park for Roller Hockey and a Skateboard Park is available at Glocester Memorial Park. Heritage Park on Chestnut Oak Road is open during winter months, with trails of up to one and a half miles in length circling the park. Glocester offers a great spot for snow sledding: Pulaski Memorial State Park off Route 44 in West Glocester. Due to erosion and safety concerns, sledding will no longer be allowed at Acotes Hill Cemetery in Chepachet. Recreation soccer is a fall activity. The program runs from mid-August through late October, and sign-up occurs throughout the early spring. Watch the Bargain Buyer for announcements or visit the web site at www.bgysa.org for more information. See Little League Baseball for information. Registration for all men's 35-and-over softball teams usually takes place in February-March. Registration fees and schedules are published in the Bargain Buyer. Although it is not town-sponsored, many of our residents play slow-pitch softball throughout the summer in this 35 and older league. Each team plays a 24 game schedule (twice a week) at Winsor Park in Harmony beginning in May. For more information or to pre-register, call Jim at 578-0794. This Red Cross-inspired swim program starts Monday, June 25 and runs for six weeks. Classes meet Monday through Friday and are 30 minutes in length. Lessons are offered to Glocester residents only, ages three through twelve. There is a nominal registration fee of $1 per child. Fees will be collected at the first lesson of the season. Registration closes Friday, June 22. Class lists and times will be posted at the town beach as well as on the town's website and facebook. Swim program starts Monday, June 25, 2018 and runs for six weeks. Tennis courts are available for public use at Glocester Memorial Park in Chepachet and Winsor Park in Harmony. Weather permitting, the nets will be put back up and the courts spruced up by April 1st. The Glocester Memorial Park courts are usually lighted until 10:00 PM Fridays and Saturdays, only from mid-April through Labor Day. Any woman 18 years of age or older may sign up either as an individual or with a partner. This is a fun league for ANY ABILITY LEVEL. Matches will be held at Glocester Memorial Park from Memorial Day through Labor Day. Contact Caitlin Coleman at ccole4768@gmail.com to register. Cost: $5.00 residents, $10.00 non-residents. Any man 18 years of age or older may sign up either as an individual or with a partner. Matches will be held at Glocester Memorial Park from Memorial Day through Labor Day. Contact Caitlin Coleman at ccole4768@gmail.com to register. Cost: $5.00 residents, $10.00 non-residents. Matches will be held at Glocester Memorial Park from Memorial Day through Labor Day. Contact Caitlin Coleman at ccole4768@gmail.com to register. Cost: $5.00 residents, $10.00 non-residents. This program is open to all children through high school age. Held at Ponaganset High School tennis courts, this six-week program usually begins in late June. Instruction, practice time, games, and tournaments are all involved based on the child's age, experience, ability, and knowledge. Mr. Richard Lawrence is the instructor. There are no fees for this program, but registration is required on the first day of instruction. This event is traditionally held on the 4th, beginning at 9:00 am on the grounds of Chepachet Union Church (directly across from the Town Hall). There are four races: a 5.5 mile race, a 1.75 mile race, a 1 mile race for children 8-12 years old, and a .5 mile race for children 7 years old and under. Please pre-register online or by mail before June 29th and save 50% on registration fees. Updated registration fees are as follows: Glocester residents $10.00 for adults and children are free. Out of town residents $20.00 for adults and $10.00 for children. All participants receive a free T-shirt while supplies last. This co-ed adult volleyball program is held Tuesday nights at Ponaganset High School. This program is open to all our residents who are of post high school age. There is no fee. Trying to lose weight or keep fit? Wondering where the best places are to walk in town? Try these great spots: Ponaganset High School Track Facility, Heritage Park on Chestnut Oak Road, and Glocester Memorial Park in Chepachet. Many people also walk in the evenings at Acote's Cemetery; pets are not allowed at the cemetery. Vandalism, we're sorry to say, is a problem at all our recreation areas. If you notice any act of vandalism, please either speak to the culprits or report them to the Glocester Police or Recreation Office at 568-6206, ext. 224. Thanks! Our youth leagues are always in need of coaches, officials, concession workers, and other caring adult workers. If you like kids and possess a positive, pleasant personality, please call the Recreation Office at 568-6206, ext. 224 or contact your favorite youth league to discover ways to help out. Thanks!